The Salentino Cuts is British rock band UFO's first album of cover songs and their 22nd and final studio album. The album was released on Cleopatra Records on 29 September 2017. "Doctor Doctor" is a song by the British hard rock band UFO, written by the band's guitarist Michael Schenker and original singer Phil Mogg. It was released as a single from the album Phenomenon in 1974, but it did not enter the UK Singles Chart. However, a live recording from the 1979 album Strangers in the Night was released as a single and became the first hit for the band. In 2010, a live version with Vinnie Moore was released in the Best of a Decade album. Lead singer Phil Mogg, guitarist Mick Bolton, bassist Pete Way, and drummer Andy Parker formed the band in 1968. Originally taking the name Hocus Pocus, the group changed their name in October 1969 to UFO in honour of the London club where they were spotted by Noel Moore, who signed them to Beacon Records label, which was headed by Antiguan-born Milton Samuel. Their eponymously titled first album debuted in 1970 and was a typical example of early hard rock including a heavy version of the Eddie Cochran classic "C'mon Everybody". Both UFO 1 and its follow-up UFO 2: Flying , were successful in Japan (especially the single "C'mon Everybody" which became a huge hit there) and Germany (the song "Boogie For George," also from the first album, reached No. 30 in German singles charts as well as "Prince Kajuku" from Flying, which reached No. 26), but generated poor interest in Britain and America. Part of UFO's early work was strongly influenced by space rock (their second album, including a 26-minute title track and a 19-minute-long opus "Star Storm", was subtitled One Hour Space Rock) that was modestly popular at the time, but the band soon realised the style was somewhat limited. In January 1972, Mick Bolton left the group, and UFO set out to find a guitarist who could provide the band with a more standard rock sound. Andrew Maynard 'Andy' Parker is a British rock drummer best known as the founding member and drummer of the Hard rock/Heavy metal band, UFO. After brief trial runs with Larry Wallis (February – October 1972) and Bernie Marsden (he toured with UFO in Europe and recorded a pair of demos, "Oh My" and "Sixteen") the band recruited Michael Schenker from the Scorpions in June 1973. Schenker was only 18 at the time but was already a well-respected guitarist. On a new label, Chrysalis Records, the revamped UFO recorded a non-LP single in 1973, "Give Her The Gun" and "Sweet Little Thing" with producer Derek Lawrence. In 1974, under producer Leo Lyons (formerly of Ten Years After), UFO recorded Phenomenon , which highlighted the band's harder-edged guitar sound. Phenomenon contains many fan favorites such as "Doctor Doctor" (later a minor hit single as a live track) and "Rock Bottom" (which was extended live to provide a showcase for Schenker). By the time of the Phenomenon tour, ex-Skid Row guitarist Paul "Tonka" Chapman joined the group, but he left in January 1975 to form Lone Star. Bernard John Marsden is an English rock and blues guitarist. He is primarily known for his work with Whitesnake, having written or co-written with David Coverdale many of the group's hit songs, such as "Fool for Your Loving", "Walking in the Shadow of the Blues", "Lovehunter", "Trouble" and the multi-million selling chart-topper "Here I Go Again." Michael Schenker is a German rock guitarist who has played in UFO and led the Michael Schenker Group. He was an early member of Scorpions the band co-founded by his elder brother Rudolf Schenker. In the mid-1970s Michael joined UFO, playing lead guitar. He left the band in 1978 to found the Michael Schenker Group. He has rejoined UFO three times, producing an album each time. Schenker continues to perform and record. He has been called "a legendary figure in the history of metal guitar." Force It is the fourth studio album by the British rock band UFO, released in 1975. It became their first album to chart in the United States. The Heavy Metal Kids were a seventies British glam rock band. In July 1976, the band recruited keyboardist and rhythm guitarist Paul Raymond from Savoy Brown to make 1977's Lights Out . This album was the pinnacle of UFO's studio career containing songs such as "Too Hot to Handle," "Lights Out," and the 7-minute opus "Love to Love." With Lights Out, the band received substantial critical acclaim. With their new-found success, the band went back into the studio to record Obsession in 1978. Later that year, the band went on tour in the USA and recorded a live album, Strangers In The Night , which was released in January 1979. Strangers was a critical and commercial success, reaching Number 8 in the UK Albums Chart in February 1979. Paul Martin Raymond was an English keyboardist/guitarist. After Schenker's exit, UFO rehired Paul Chapman on guitar who brought over unused track ideas from Lone Star's drummer Dixie Lee. Shortly after, they released their next LP, No Place to Run , in January 1980. Produced by former Beatles producer George Martin, No Place To Run failed to match up to the success of its predecessors, though it fractionally missed the UK Top 10. Paul Raymond left the band at the end of the No Place To Run tour and was replaced by John Sloman from Uriah Heep on keyboards for a couple of months and then by former Wild Horses guitarist and keyboardist Neil Carter, who helped fill the void in the songwriting left by Schenker's departure. Carter debuted with UFO on stage at the three-day Reading Festival on 23 August 1980, when the band played as the Saturday night headline act. At the beginning of the following year, UFO released the self-produced The Wild, the Willing and the Innocent , which had a lighter pop rock sound, which was popular at the time. The album achieved mild success in the UK, reaching the UK Top 20, and the single "Lonely Heart" was released. In February 1982 the band released Mechanix . It was very successful in the UK, where it reached No.8, the band's highest ever placing. Later that year, founding member Pete Way left the band to form Fastway with Motörhead guitarist "Fast" Eddie Clarke and then his own band, Waysted. He was replaced by Talas bassist, Billy Sheehan. UFO released Making Contact in 1983, but the album was a critical and commercial failure. Thus, that March, UFO decided to disband. The band played a UK farewell tour with Paul Gray (ex Eddie and the Hot Rods and The Damned bassist). However, there was a hint that this might not be permanent, when UFO released a compilation album featuring songs by UFO (as well as other groups featuring ex-members of UFO) entitled Headstone, the sleeve of which showed a headstone, denoting UFO with their formation date but an incomplete end date. In 1991, Mogg and Way decided to put a new UFO line-up together with former Wild Horses members Clive Edwards on drums and Laurence Archer on guitar joining the band and released High Stakes & Dangerous Men . While only released on a small independent label, High Stakes was enough to generate serious interest in a full-blown reunion. The following year, the classic late-1970s UFO line-up – Mogg, Schenker, Way, Raymond and Parker – reunited, and the resulting album was Walk on Water (1995). This line-up (barring Parker's replacement by AC/DC's Simon Wright on drums) went on a world tour. However, tensions arose again, and Schenker left the band only four shows into the tour, walking off stage mid-set at the very same Palo Alto venue where their October 1978 tour died. Thereafter, the other members again went their separate ways. [ citation needed ] However, Schenker returned to the fold in 1998 and the band embarked on another tour, with Parker again replaced by a new drummer. They played at the Astoria, Charing Cross Road, London in 1998. In 2000, Schenker rejoined UFO again and the band released the double CD Covenant (with Aynsley Dunbar on drums), which contained a disc of new material and a disc of live classics. In 2002, the band recorded Sharks ; shortly after Sharks was released, Schenker left the band yet again and was replaced with Vinnie Moore. and the official announcement was made in July 2003  In 2003, Michael Schenker and Pete Way released The Plot with drummer Jeff Martin. In 2004 UFO released their 17th studio album You Are Here with their new permanent guitarist Vinnie Moore and Jason Bonham on drums (intermittently). UFO recorded their live set and released a double-DVD recording titled Showtime (2005) along with a double live CD on SPV in November 2005, mixing a number of re-recorded studio songs. In November 2005, Andy Parker returned to the band to play in the Piorno Rock Festival in Granada, Spain. UFO's eighteenth studio album, titled The Monkey Puzzle , was released in 2006. UFO released their 19th studio album, The Visitor , in June 2009,  and followed with a tour of the UK, but without Pete Way, who was suffering from a medical condition. Bass tracks on The Visitor were played by Peter Pichl, and Pete Way was not credited as a band member on The Visitor cover, nor was any other bassist. However, the album saw UFO's return to the UK Top 100 album charts for the first time in almost 15 years. UFO 1 is the debut album by British rock band UFO. It was first released in the UK by Beacon Records in October 1970. The first US release was on Rare Earth Records in April 1971. Neither of these releases charted; however, the album did become a success in Germany and Japan. No Place to Run is the eighth studio album by the British rock band UFO. It was released in January 1980 by Chrysalis Records. It is the first album to feature Paul Chapman who replaced Michael Schenker on lead guitar. Covenant is the fifteenth album by the British hard rock band UFO. It was published as a limited edition 2-disc album, with disc 1, titled Covenant, containing entirely new material, and disc 2, titled Live USA, containing a collection of classics performed live. Covenant saw the return of Michael Schenker on guitar, as he had left the band in the middle of the Walk on Water tour. 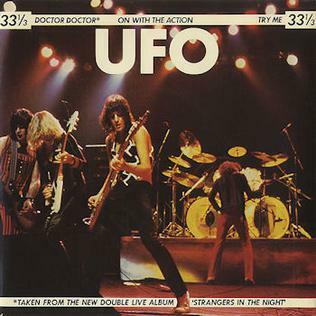 Phenomenon is the third studio album by the British rock band UFO, released in May 1974. The Wild, the Willing and the Innocent is the ninth studio album by the British hard rock band UFO and the first to be entirely self-produced by the band. The song "Lonely Heart" was a minor UK hit single. The original cover was as usual designed by the art studio Hipgnosis. This is the band's first album with the former Wild Horses' keyboard player Neil Carter, replacing Paul Raymond, who had left to join the Michael Schenker Group. Misdemeanor is the twelfth studio album by the British hard rock band UFO. After the disastrous tour supporting Making Contact, UFO disbanded, with Phil Mogg spending time in Los Angeles, where he contacted guitarist Atomik Tommy M. Mogg decided to start a new band, involving the new American guitarist and Paul Gray, who had played bass guitar in the last UFO tour. The three of them recruited former UFO keyboard player Paul Raymond and drummer Robbie France and started writing new material. Chrysalis Records signed the new band as UFO and assigned experienced producer Nick Tauber for the recording process of a new album. France resigned before the recording started and was replaced by former Magnum drummer Jim Simpson. Paul Raymond quit the band during their US tour in August 1986 and was replaced for the rest of the tour by David Jacobson. You Are Here is the seventeenth studio album by the British hard rock band UFO, released in 2004 through the German label SPV/Steamhammer. This is the first album to feature new band members Vinnie Moore and Jason Bonham, who replaced long-time guitarist Michael Schenker and drummer Aynsley Dunbar. Walk on Water is the fourteenth album from the British hard rock band UFO, marking the return of German guitarist Michael Schenker to the band. The album did not chart. It was recorded at Rumbo Recorders in Canoga Park, California. It was released first and only in Japan on 14 April 1995 with 11 tracks and in 1997 in other countries with only 10 tracks. It has since been re-released on numerous occasions, with a variety of covers. The Monkey Puzzle is the eighteenth studio album by the British hard rock band UFO. It was released on 25 September 2006 in Europe and a day later in the United States. It also marks the return of founding drummer Andy Parker to the band and the last to feature founding bassist Pete Way. Live on Earth is a live recording of the band UFO. It was recorded in Vienna, Austria in 1998 and features four-fifths of the reformed, classic line up of the band from the late 1970s with Simon Wright replacing Andy Parker on drums who had decided to run his family business rather than tour. 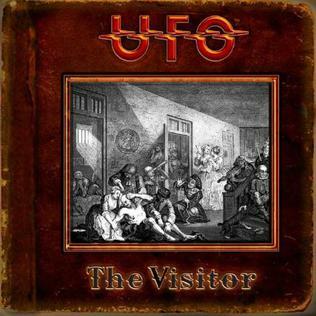 The Visitor is the nineteenth studio album by the British hard rock band UFO, which was released on 2 June 2009. It was their first album in three years since the release of The Monkey Puzzle in 2006. Bass parts were recorded by Peter Pichl. Since there are no writing credits on the album booklet, they were posted on UFO's official website. ↑ Prown, Pete; Newquist, HP (1 January 1997). "Legends of Rock Guitar: The Essential Reference of Rock's Greatest Guitarists". Hal Leonard Corporation. Retrieved 14 February 2017– via Google Books. ↑ Strong, Martin C. (2000). The Great Rock Discography (5th ed.). Edinburgh: Mojo Books. pp. 1014–1016. ISBN 1-84195-017-3. 1 2 3 "UFO's PHIL MOGG To Step Down After 50th-Anniversary Tour: 'This Is The Right Time For Me To Quit'". Blabbermouth.net. 28 May 2018. Retrieved 28 May 2018. 1 2 3 4 5 6 7 8 9 10 11 12 13 14 15 16 17 18 19 20 21 22 23 "Phil Mogg: I Am Leaving UFO". Ultimate-Guitar.com. 29 May 2018. Retrieved 29 May 2018. ↑ "Artist Chart History – UFO". Billboard charts . Retrieved 20 November 2016. ↑ "UFO Discography". Official Charts Company . Retrieved 20 November 2016. ↑ "UFO – Seven Deadly". spincds.com. Retrieved 20 November 2016. ↑ "Lights Out (Discontinued)". soundstagedirect.com. Retrieved 20 November 2016. ↑ "The Greatest | Show Cast, Episodes, Guides, Trailers, Web Exclusives, Previews". VH1.com. Retrieved 28 June 2014. ↑ Saulnier, Jason (23 January 2009). "Michael Schenker Interview". Music Legends. Retrieved 6 May 2013. ↑ Tobler, John (1992). NME Rock 'N' Roll Years (1st ed.). London: Reed International Books Ltd. p. 345. CN 5585. ↑ Tobler (1992). NME Rock 'N' Roll Years. p. 378. CN 5585. ↑ "UFO – Family Tree – 1980 to 1990". Beatsworking.tv. Archived from the original on 28 April 2013. Retrieved 28 June 2014. ↑ "UFO – Press Articles – 1987". Beatsworking.tv. Archived from the original on 24 May 2016. Retrieved 28 June 2014. ↑ "It's Official: Vinnie Moore, Jason Bonham Join Ufo". Blabbermouth.net. 29 July 2003. Retrieved 28 June 2014. ↑ "UFO To Release 'The Visitor' In The Spring". Archived from the original on 12 September 2009. ↑ "UFO". Ufo-music.info. Archived from the original on 18 July 2014. Retrieved 28 June 2014. ↑ "Ufo Announces Initial Batch Of 2011 North American Tour Dates - Blabbermouth.net". Roadrunnerrecords.com. 1 December 2010. Retrieved 28 June 2014. ↑ "Ufo: New Album Title Announced - Blabbermouth.net". Roadrunnerrecords.com. 11 November 2011. Retrieved 28 June 2014. ↑ "Ufo: New Album Release Date Announced - Blabbermouth.net". Roadrunnerrecords.com. 7 November 2011. Retrieved 28 June 2014. ↑ "Music News & Reviews". Music Street Journal. Retrieved 28 June 2014. ↑ "UFO: 'A Conspiracy Of Stars' Track Listing Revealed". Blabbermouth.net . 8 December 2014. Retrieved 8 August 2016. ↑ "UFO – Here's a progress update from Vinnie re the new... – Facebook" . Retrieved 14 February 2017. ↑ "UFO's Covers Album, 'The Salentino Cuts', Due In September". Blabbermouth.net . 1 August 2017. Retrieved 1 August 2017. ↑ "UFO Keyboardist/Guitarist PAUL RAYMOND Dead At 73". Blabbermouth.net. April 13, 2019. Retrieved April 13, 2019. 1 2 3 4 5 6 7 8 "UFO – Similar Artists". allmusic.com. Retrieved 20 November 2016. 1 2 3 4 5 6 7 8 9 "Rock Legends UFO Release Covers Album, "The Salentino Tapes," Interview With Guitarist Vinnie Moore". standing-room-only.info. 2 October 2017. Retrieved 23 December 2017. 1 2 3 4 5 6 "A Conspiracy of Stars: Why is UFO classic rock's best-kept secret?". somethingelsereviews.com. 26 February 2015. Retrieved 12 May 2017. 1 2 3 4 5 6 7 ""The Salentino Cuts": l'album di cover della band Ufo – Rock by Wild". rockbywild.it. 1 August 2017. Retrieved 30 September 2017. 1 2 3 4 5 "UFO: Gastão e Clemente contam a história da banda". whiplash.net. 2 December 2017. Retrieved 17 January 2018. 1 2 3 4 5 6 7 8 9 10 "Old News". ufo.dave-wood.org. 7 January 1999. Retrieved 17 January 2018. 1 2 3 4 5 6 7 8 9 10 11 12 13 "Phil Mogg neemt afscheid van UFO". zwaremetalen.com. 29 May 2018. Retrieved 9 June 2018. ↑ "Midwest Metal Magazine interview with Tom Araya". Midwestmetalmagazine.com. Archived from the original on 8 December 2008. Retrieved 7 February 2017. ↑ "Testament Frontman Talks Songwriting, Influences". Blabbermouth.net. 20 August 2013. Retrieved 7 February 2017. ↑ "The Knowledge: Testament". teamrock.com. 21 April 2014. Retrieved 7 February 2017. ↑ "Dexter Holland News, Pictures, and Videos". tmz.com. Retrieved 12 May 2017. ↑ "Buy UFO tickets, UFO tour details, UFO reviews". inner-city.co.uk. Retrieved 6 December 2017. Wikimedia Commons has media related to UFO (band) .